Eucalyptus is a flowering tree native to Australia and there are 700 species of them found in these forest regions. The koalas sleep for nearly 22 hours in a day, for that is the amount of rest it needs to help in digestion of the gum leaves, which are low in nutrition and high on fibrous content. The koalas are basically tree creatures and live in the top and middle layers of the eucalyptus forests. But even the koala's adorable and iconic status in Australia haven't spared it from the ravages of mankind. Once numbering in the millions, koalas suffered major declines in population during the 1920s when they were hunted for their fur. The koala was hunted almost to extinction. Today, habitat destruction, traffic deaths, and attacks by dogs kill an estimated 4,000 koalas yearly. Since the arrival of the Europeans in the early 17th century, almost 80% of the eucalyptus forests have vanished. The 20% that remain are unprotected and mostly privately owned, making it an automatic target for deforestation and development. As over four-fifth of Australia is hot and barren in the middle, settlers prefer the fertile and rainy zones of the East coast and this is where they come into direct conflict with the koala's habitat. Clearing, logging, urban expansion and pollution have followed these pockets of human habitation, posing a threat to the koala's survival. Loss of habitat, owing to deforestation, means the koalas are out of their safety zones of tree-tops and potential victims of vehicular accidents. Venturing into private estates for food makes their inherent slowness perfect targets for dogs and cats. Starvation is then a natural fall-out. Disturbance from noise emanating from nearby human habitations is one more threat to the koala's health, since it is so dependent on sleep. Pesticides flowing into steams and waterways passing through the koala habitat is another cause for worry. Indiscriminately planting eucalyptus trees in koala habitats in the name of reforestation is showing little signs of helping koalas. The koalas of different regions diet on specific species of eucalyptus suited only to them. Scientists figure that such multiple sources of disruption to the koala habitat could lead to a high incidence of disease among the animals. Chlamydia is one such disease that assails the koalas under stress. Sore eyes, blindness and chest infections are common to Chlamydia. Even worse, sore throats can occur, making it impossible for the koala to eat. Cancer and leukemia have also been known to afflict the koala. In contrast to the situation on much of the mainland, the koalas of many island and isolated populations have flourished. In the absence of predators and competition, combined with an inability to migrate to new areas, koala populations can become unsustainable. Although culling has been suggested as a means to reduce koala numbers, this has met with fierce opposition both domestically and internationally, and the species remains protected. 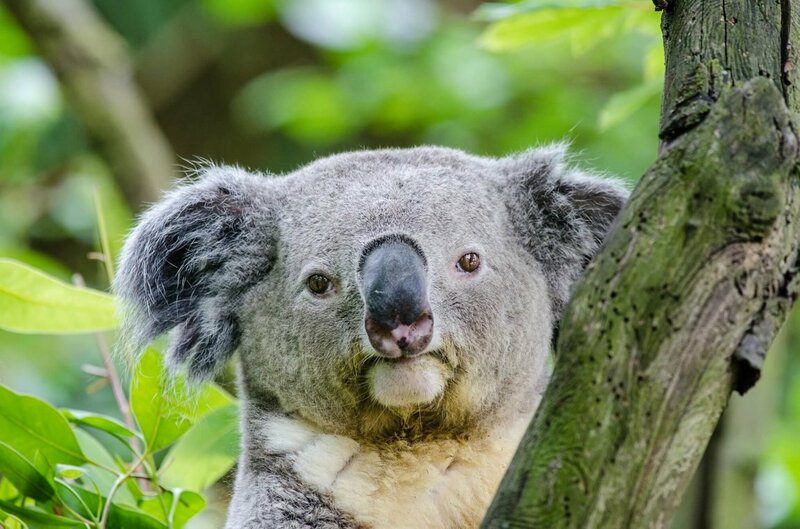 The popularity of the koala has made the possibility of a cull politically improbable, with any negative perception likely to impact on tourism and a government's electability. In place of a cull, sterilization and translocation programs have had only limited success in reducing numbers thus far, and remain expensive. There is evidence that koalas relocated to the mainland have difficulty establishing themselves in the different circumstances. A mooted alternative to the complex sterilization method, wherein the animal must first be captured, are hormonal implants that can be injected via darts. On the mainland, koala populations in Queensland is only 40% of what it was once was. In New South Wales, it is 33%. A recent count revealed that there may be around 43,000 of these creatures presently in Australia, down from over 100,000 a century ago. The Australian environment ministry has demarcated select koala habitats of Queensland and New South Wales as protected zones from deforestation and development and officially recognized the animals' status as one of the most endangered species. Immediate action must be taken now to stop the koala bear from going the way of the Tasmanian Tiger.